MINNEAPOLIS — CBD oil is old news now. Its popularity for anxiety relief, pain relief and sleep aid is well-known among people. As with many good things, it seems like it's in our nature to want to share the good stuff with our four-legged buddies. 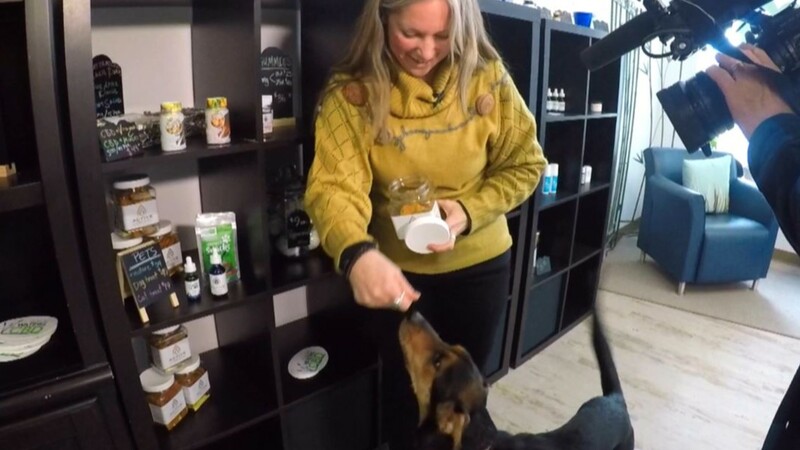 Whether it's that last bite of steak, or a piece of potato chip, many in the Twin Cities area seem to want to share CBD oil and its benefits with their cats and dogs. That's where CBD oil products for pets come in. “We wanted to open the store to help guide people by good products,” Denise Loehr said. Loehr and Paul Cherba are co-owners of Calm Waters CBD located in Golden Valley. RELATED: What is CBD oil? Does it work? They carry zero percent THC, CBD products for humans as well as pets. Loehr said the reason pet owners may seek CBD oil products for their pets may be similar to the reasons they might seek some for themselves. “[If] it's a pain thing or anxiety or seizure things like that, they're going to benefit,” she explained. For Loehr and Cherba, CBD oil has worked for their three dogs. Loehr said she especially noticed its effects on her oldest dog that had surgery for arthritis. “My 14-year-old, she's a chocolate lab and if we miss a dose, she is moaning and groaning that whole time,” Loehr said. Another interesting point she brings up: animals don't know anything about the placebo effect. Therefore she said she knows the pain-related behavior change is a real one. During the shoot for this story, I brought my dog Mac along to Calm Waters CBD. While there, he received a sample treat. Loehr said for a 30 lbs dog, two treats– once in the morning and once at night– would be a good dose to start with. To no one's surprise, Mac loved the treat and begged for more. Although he doesn't have any issues with chronic pain, we did notice that after an hour or so, he was calmer. Even with plenty of people going in and out of the store, he remained happy but not frantic. Mac also fears car rides. He was shaking all the way to the store in the back seat. On the way back, I noticed he didn't shake, at least from what I could observe. Just like CBD products for people, CBD products that Calm Waters carries is zero percent THC. Loehr said there is no risk of a high or any psychoactive reactions. The bottom line for CBD products for pets is that it presents itself as an option for you. It's available– if you ever decide to try it out.